Pontiac GTO With Kilduff Shifter! - Muscle Cars Zone! Pontiac GTO With Kilduff Shifter! People are constantly coming up with new and upgraded ways to modify their vehicles, whether that is a paint job or a complete engine swap. We have previously seen the awesome progress that was achieved in the car`s paint job, but this time we check out a completely different video in which this guy demonstrates a totally awesome mod you can do to your car. We are talking about the crazy Kilduff Shifter and if you have never heard about it, this is the perfect chance to see what all is about. The video is fairly short, just over a minute long but it is enough to demonstrate us how the Kilduff Shifter works. He installed it on his 2006 GTO and it indeed looks awesome even from the first glance. He then starts up the car and shows the way you can shift gears. It is absolutely crazy but it does work as it can be seen in the dashboard. The gears shift perfectly and the four handles used in the Kilduff Shifter work like a charm. Everything in the car works as it used to work before this awesome shifter was installed, such as the door locking mechanism when you shift in first gear. Though at first you might find this amazing shifter a bit difficult to understand and get used to it while driving, you will eventually get the idea and master it. 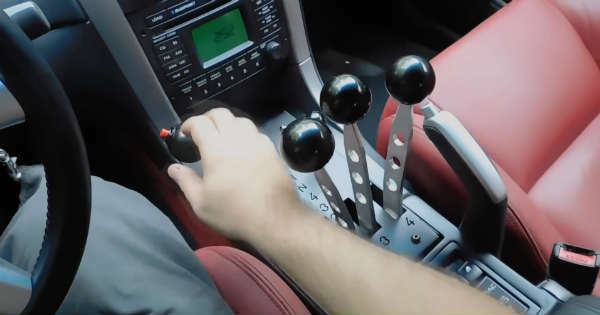 What do you think; would you ever do this amazing mod and install thus type of shifter into your car?